Champs! 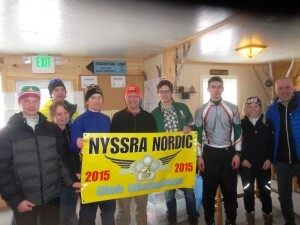 – NYSSRA Nordic Inc.
With all of this light grippy snow Spring skiing has not yet arrived. Racers enjoyed terrific conditions for this weekend’s NYSSRA Championships. 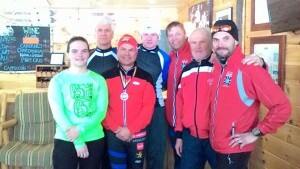 Just a week after the Loppet, Scramble and Tourathon Racers were back for more! Biathlon, Ski-O, and Cross country held well attended events. Including this years First (annual?) Biathlon, ski-o and Cross country relays. Some Highlights: Olympian Dr. Robert Duncan Douglas showed up, greatly increasing the pace of races he entered (and won). The Mixed Relay had a 13 second gap between silver (Saratoga) and gold (Peru), Rumor has it difficulty in the tag zone accounted for at least 10 of those seconds. Adirondack Vauhti allied with Glenville Hills to squeak out their second Mens Club relay victory. Peru and HURT were not far behind. Peru Racers Zullo and Cook skied solid biathlon legs to put Peru in gold and silver position for the women’s relay. 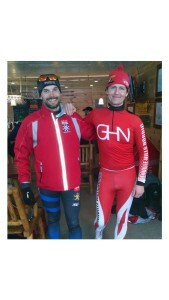 Watch out for Saranac Lake, this year the Alberga Bros were mid pack racers but they are U16 and U14! I will be looking over my shoulder in the years to come. To say Sunday’s conditions were perfect would be an understatement! Tracks were firm, fast, and kick was solid. It was a great day to be on skis. NYSSRA racers tested out this years D1 national course, and it did not disappoint. Peru showed up with a swarm of racers. They raced like it was their last day on snow. Duncan Douglas took the top spot with Jan Wellford in second, and HURT’s Aaron Huneck faded to third after Spending time in the lead. Congrats to the Scolastic racers in the top 10, nice work. * search by bib # for high res photos from the race. In spite of a forced error early in the race, HURT’s Dave P-K regained contact with, and eventually broke away from his pack and finished a solid 5th place Nearly tying 4th place racer Mike Wynn. Hurt’s Heidi Underwood and Peru’s Rosanne VanDorn took the top spot for the ladies. For anyone who wants to see what I am writing about, check out our photographer’s page, and perhaps make a purchase. Hopefully all of you will enjoy the warmer weather, and with it some spring skiing. 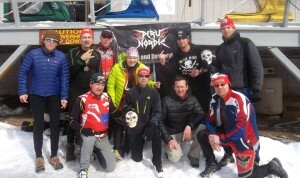 Saratoga Biathlon is hosting events this weekend, so keep on racing.